Buying a new trampoline for your family can be an exciting thing, but also potentially a bit overwhelming. You'll quickly realize there are a lot of things to consider and choose from. Probably more than you were expecting. Before we dive into our Zupapa trampoline review, let's take a quick look at some of the most important things to consider when shopping for a new trampoline. What is a TUV Approved Trampoline? Is the weight limit enough? Think about who will be using the trampoline most and how much weight will be on it. Make sure the trampoline you choose can accommodate enough weight. Does the trampoline have a safety net? These are highly recommended and can help to reduce the risk of falling injuries. Is there enough space in your yard? It won't do you much good to buy a trampoline you can't safely place in your yard. You'll want to get a trampoline that allows you to place it in an area with around three feet of clearance around the entire frame. Does it have padding? This is important. 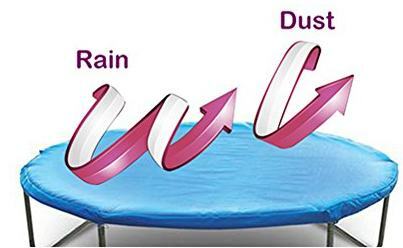 The metal frame and springs on your trampoline can pose injury risks. Make sure you choose a trampoline that comes with good padding to cover these components and mitigate this risk. If the padding is UV protected, that's even better since it means you won't have to replace it too soon. Does the manufacturer make it easy to get replacement parts? Most people probably won't think of this, but you're going to have to replace things like springs, mats, and safety nets eventually. Some manufacturers make it easier to get these parts than others. What kind of warranty does the manufacturer offer? Typically, you're going to want to look for a trampoline that comes with a solid warranty to make sure you're covered in the event something breaks or wears down before it was meant to. The longer the warranty lasts and the more parts it covers, the better. All Zupapa trampolines are TUV certified. ​Spring and frame pads are included. ​Includes additional accessories like a rain cover and wind stakes. Multiple sizes available to meet your specific needs. 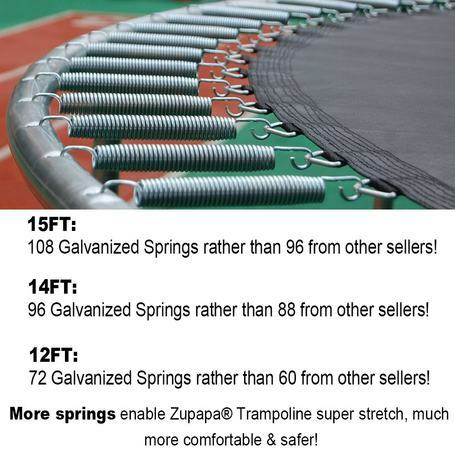 Zupapa makes what we consider to be some of the highest quality, most durable, and safest trampolines on the market. Solid construction with a frame engineered from deep galvanized steel, TUV certification, and included safety accessories mean these trampolines check off pretty much everything on our must-have list. While not perfect, you'll be hard-pressed to find something much better than this, especially for the price. You may be asking yourself what TUV certification is and why it's so important. TUV is considered to be one of the world's leading authorities on product safety testing and certification. To gain a TUV certification, a product must be thoroughly tested to meet thorough safety guidelines. A trampoline may claim to be safe, but you know you've got the stamp of approval from an organization that specializes in ensuring product safety when you see the TUV certification seal. This is the largest trampoline available from Zupapa and you'll want to make sure you have a lot of empty space in your yard to accommodate. This large trampoline also has the highest weight capacity though, which means you can safely accommodate more jumpers at one time. The 15-foot trampoline can hold up to 375lbs. Depending on the size and weight of each jumper, this means up to five people can safely jump at one time. 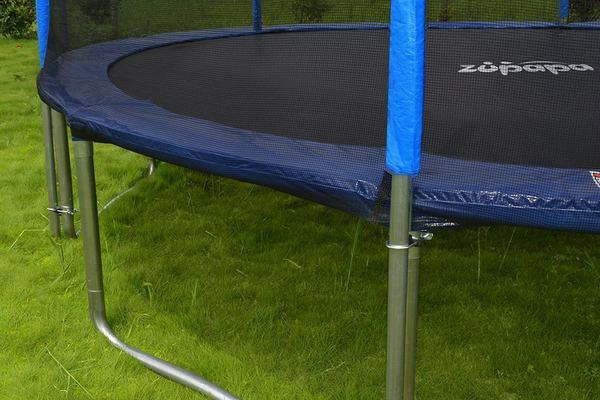 The Zupapa 15-foot trampoline is currently available for $479.99. Coming in at just a little smaller than the 15-foot, the 14-foot Zupapa trampoline is the mid-sized option in the family and one of the more popular choices because it doesn't require quite as much room and doesn't lose any of the weight capacity of the larger trampoline. 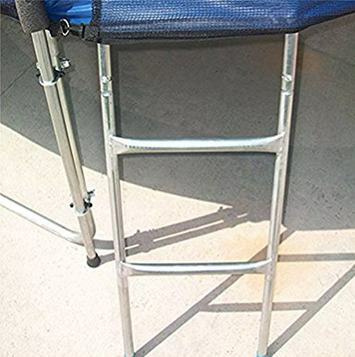 The Zupapa 14-foot trampoline can hold up to 375lbs. Because it's slightly smaller, depending on the size and weight of each jumper, the 14-foot trampoline can safely accommodate up to four people at a time. 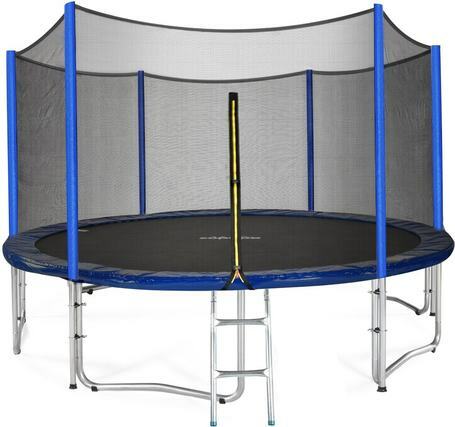 The Zupapa 14-foot trampoline is currently available for $459.99. This is a good choice if you're working with a smaller space to set your trampoline up in. The 12-foot trampoline is still large enough to accommodate several people and the weight limit isn't too restrictive. The lower price makes this an attractive option for a lot of people as well. 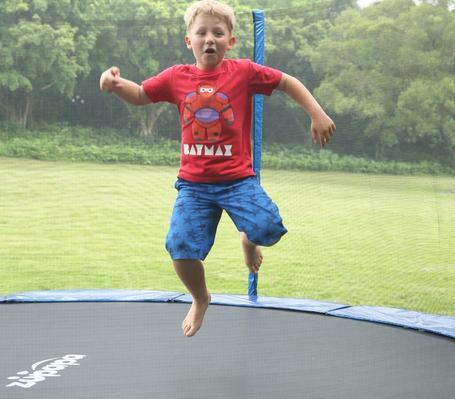 The Zupapa 12-foot trampoline has a maximum weight capacity of 330lbs. Depending on the size and weight of each jumper, this trampoline can hold up to three people at a time. 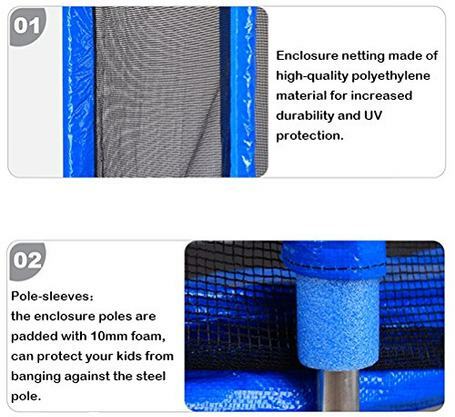 The Zupapa 12-foot trampoline is currently available for $399.99. If you're looking for a 10-foot trampoline, Zupapa, unfortunately, does not offer one in this category. We suggest considering the 12-foot model instead. Fit leg extensions into leg bases and secure with bolts. Fit circular frame extensions together and secure with bolts. ​Secure assembled legs to the assembled circular frame. ​Attach springs to rungs in the circular frame. ​Attach jumping surface by connecting each rung on the surface to one spring. ​Aside from installing the safety net, this is probably the most labor-intensive and time-consuming part of the assembly (aside from installing the safety net) but still shouldn't take long. ​Attach safety pads and make sure they completely cover the frame and springs. ​Connect safety net coils to each leg. ​Attach safety net to coils. ​This has been reported by many to be the most frustrating part of the installation and it can take quite a bit of time to get it right. We recommend making sure you place your trampoline in a place you know you're going to want to keep it for a long time so you don't have to do this more than once. ​Attach safety pads to safety net coils. When you see these steps listed out, it looks like a lot of work. In reality, setting up your trampoline shouldn't take you more than a couple of hours. While Zupapa manufactures what we believe to be some of the best trampolines available, they remain a bit of a mystery as a company. We've had trouble locating an official website for the company, which can make things like contacting them directly a bit of a hassle. Still, when you are able to reach them, they offer some great customer service and their warranties are some of the best in the business. Contacting customer service can be a challenge if you've misplaced the documentation that came with your trampoline. We strongly recommend keeping these documents in a safe place so you have access to the company's contact information if and when you need it. Customer service is very responsive however and will gladly help you with any questions or concerns you have regarding your trampoline. While the company does not appear to have an official website, even if you do lose your documentation, they can be reached through their Facebook page or by contacting them through their seller profile on Amazon. Safety pads - Covered for six months. Safety net - Covered for six months. ​Jumping surface - Covered for one year. ​Springs - Covered for one year. Frame - Covered for three years. A good variety of size options available. ​Lots of safety accessories included. ​Best warranty available on the market. No official company website as far as we can tell. Customer service contact information can be difficult to locate (don't lose your documentation). ​Safety net installation can be problematic. No 10-foot size option for smaller yards. Another popular brand you'll most likely run into while you're shopping is Skywalker. This company is every bit as good as Zupapa, although there are some differences between the two and your buying decision between the two companies may be swayed by exactly what it is you're looking for in a trampoline. Skywalker is not TUV certified, but they do meet ASTM Safety Standards. This is still an important safety certification, just issued by a different organization that may not have the same standards. Skywalker's trampolines are smaller, ranging from 8-foot to 14-foot in the oval category. If you're looking for larger trampolines, they're probably not going to be your best bet. However, if you need an 8-foot or 10-foot trampoline not offered in the Zupapa family, this may be an option for you to consider. Skywalker's trampolines typically have a lower weight limit, somewhere in the neighborhood of 200lbs. If higher weight limits are important to you, Zupapa is definitely where you need to be. Availability isn't dependent on season. You can usually find exactly what you want year round, with the rare exception being when orders are unusually high. Even in this case, it may just take a bit longer for your order to ship. Ordering on Amazon ships the trampoline straight to your house. No need to worry about loading it into your personal vehicle, transporting it home, and then unloading it. The shipper takes care of all of this for you. Ordering through Amazon provides you with direct access to Zupapa customer service in case you need any help or have questions about your trampoline. Finding the right trampoline to meet your needs really depends on exactly what those needs are and what you're looking for in a trampoline. As you can see in our Zupapa trampoline review, this is a widely popular brand for many reasons, and it's pretty hard to go wrong with them. Hopefully, we have provided you with enough information to make an informed buying decision. Happy jumping and, as always, stay safe!